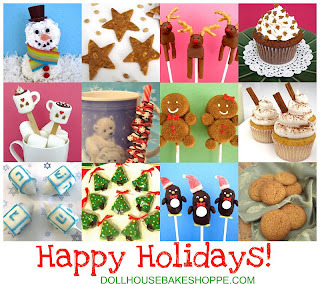 I am so honored to have had the opportunity to create the "Holiday Bakeshop" recipe collection for the Decemeber/January 2013 issue of Family Fun magazine. I have had my work published in the magazine multiple times, but when I was approached about doing the entire holiday feature this year, I was beyond thrilled. It was especially fun to see my work recreated in the photos in the magazine and always so exciting to see my name published! The fourth recipe published in the collection is my sugar plum cookie bars. These bars are made from a cakey/sugar cookie like dough, filled with homemade plum preserves. 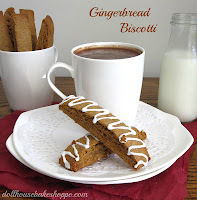 They were inspired by the classic newton cookie bar, with a fun winter twist. You can also try using other dried fruits in the filling recipe like dried apricots or dried figs! For a more simple alternative, use refrigerated sugar cookie dough in place of the dough recipe and fruit preserves instead of the filling recipe for a quick, easy and yummy alternative! 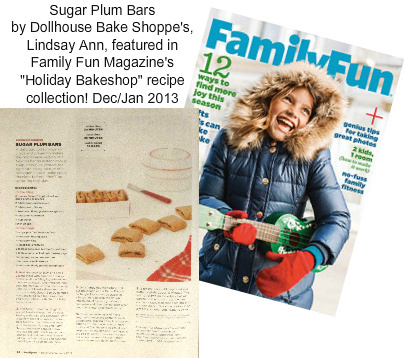 Check out my bars in the December/January 2013 issue of Family Fun Magazine as part of my "Holiday Bakeshop" recipe collection! This recipe takes a few more steps than a traditional bar or cookie, but they turn out so fresh and delicious, compared to the pre-packaged ones from the grocery store. I provided a step-by-step tutorial below, to guide you through the tricky parts. Prepare your dough and roll it out into a 9"x 10.5" rectangle, on top of a piece of flour dusted parchment paper. Cut your dough into three 3 1/2" strips. Cut the parchment paper between the three strips so each dough strip is on it's own strip of parchment for easy transportation to the baking sheet. Spread an even layer of filling down the center of each dough strip. Fold each side of the dough up and over the filling, so they meet in the center, making sure one side slightly overlaps the other. Gently press two sides together to create a seam down the strip of dough. Slide your hand or a long metal spatula under each strip of parchment to lift the dough strips and gently flip over onto prepared baking sheet. (This will create a smooth top with the seam along the bottom that overlaps in the center creating the recognizable curved shape of a classic newton cookie). Make sure each strip if about 1-2 inches apart and place in the over. Bake until the bars are set and puffed slightly. Remove from the oven and use a pizza cutter or a sharp knife to cut each bar into 3 pieces each OR 6 smaller pieces (shown below) before cookies start to harden. Transfer cookies to an air tight container to soften or enjoy warm and crisp out of the oven! Prepare dough: Sift or whisk together the flour, baking soda, salt and cinnamon in a small bowl and set aside. With an electric mixer, beat together the butter and sugar, on medium speed, until the mixture is light and fluffy, about 3 minutes. On low speed, add the egg, vanilla and zest until incorporated. Slowly add in flour mixture. The dough will be very soft. Wrap the dough in plastic wrap, flatten into a disc and refrigerate a few hours or overnight until it has firmed up a bit. Prepare Filling: Combined all ingredients into a medium saucepan over medium heat. Cook, stirring occasionally, until the prunes break down and the mixture is soft and gel-like, about 15-20 minutes. Use a sharp knife to chop mixture, breaking up any large pieces of prune or place mixture into a food processor and pulse until the mixture is smooth. Assemble and bake: Preheat the oven to 350 degrees F. Line a baking sheet with parchment paper. Place a large piece of parchment paper on a flat surface for rolling your dough. Dust the parchment paper and your dough generously with sifted flour to prevent sticking. Using a rolling pin, roll the dough into a 9"L x 10.5"H rectangle that is about 1/4" thick, on top of the floured parchment. Using a pizza cutter, cut your dough, width wise, into three, 3 1/2" wide strips, so you have three even strips. Cut the parchment paper between the three strips so each dough strip is on it's own strip of parchment for easy transportation to the baking sheet. Gently dust away any excess flour. Spread an even layer of filling down the center of each dough strip. Fold each side of the dough up and over the filling, so they meet in the center, making sure one side slightly overlaps the other. Gently press two sides together to create a seam down the strip of dough. Slide your hand under each strip of parchment to lift the dough strips and gently flip over onto prepared baking sheet, placing the three filled strips a few inches apart. (This will create a smooth top with the seam along the bottom that overlaps in the center creating the recognizable curved shape of a classic newton cookie). Bake for about 20-25 minutes or until the bars are set and puffed slightly. Remove from the oven and use a pizza cutter or a sharp knife to cut each bar into 3 pieces each OR 6 smaller pieces before cookies start to harden. Transfer cookies to an air tight container. Note: cookies might be a little harder (cookie like) just after baking, but they will soften overnight and become more like a traditional (cakey) newton cookie. 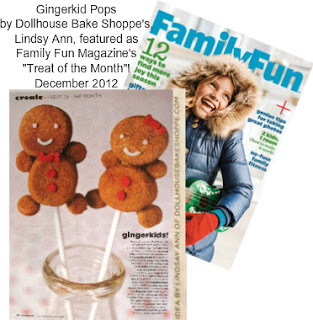 To add to the excitement, my Gingerbread Kid Marshmallow Pops were also featured in the magazine as their "Treat of the Month"! 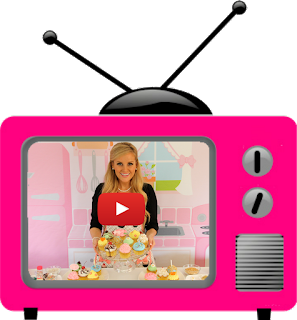 Click here for my step-by-step tutorial and make your own!